Thunderbolts is a title that has evolved from a team of super villains to a secret team of deadly operatives tasked with taking out terrorists. Led by the Red Hulk, the team of the Punisher, Venom, Deadpool, Elektra, Mercy and the Leader don’t quite work well together yet managed to be successful in their first mission. Will their new one go better? Will the title’s change in tone be able to last? Major Spoilers looks at the latest issue for the answers! Previously in Thunderbolts: An overly-complicatedly-named gamma machine capable of powering mech suits has found its way into the hands of someone targeting Middle Eastern terrorists. Red Hulk and his team set out to find the machine and person responsible. Oh, and Punisher and Elektra are doing the dirty and Deadpool is none too happy about it. 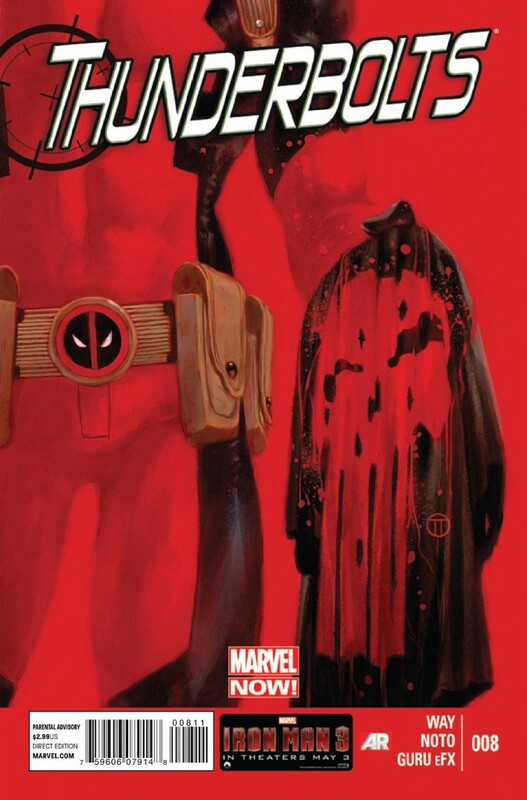 The issue opens with a confrontation in Chechnya between the Red Hulk and a former U.S. citizen, now a terrorist. After getting the info he came for, Red Hulk has his team gun the man down. We’re then presented with a scene of a man lecturing at the University of Cambridge on the true definition of terrorism. The rest of the issue sees the Thunderbolts interrupting an illegal arms trade in hopes of finding their target. Things end with a boom, quite literally. The idea of the true definition of a terrorist is compelling but I feel like it is getting mishandled here. The Thunderbolts kill terrorists, the evil “bad guy” who readers know all too well from real life. Way introduces the question as to what a terrorist really is and while this could lead to some interesting storytelling, it feels like it’s only being used as a character trait for who I assume will be the villain of this arc. Our lecturer (who isn’t named and I’m not sure if we’re meant to recognize him) believes terrorism’s true definition is not what we’ve been told. I like this (and slightly agree) but its use makes the story slightly predictable. This character seems to be blatantly set up as the man behind the attacks. Maybe this won’t be the case, but I highly doubt it. It looks to be leading to a story that will ask the question: Is someone a terrorist if they murder terrorists? And does that make our heroes like the villain? These are ideas that have been presented before and I hope Way takes the story in a different direction. The rest of the book is entertaining and action packed, but a few other problems arise. The “love triangle” between Deadpool, Punisher and Elektra was fun at first, but has dragged on for too long. To stop him from murdering Punisher they shoot Deadpool in the head, making him completely useless to the story, except to add humor. I hope this little subplot gets wrapped up soon as it takes up too much space in the story and feels quite silly. Otherwise, I’m quite enjoying the title and this issue felt suspenseful, much like a spy movie. Way has a difficult time giving the book a consistent tone though, one minute comedic, the next violent and serious. It all makes for an issue that doesn’t completely come together. Phil Noto’s art has been great and I’m actually enjoying it more than Dillon’s work on the book. Don’t get me wrong, I love Steve Dillon’s art but it just didn’t work on this title. Character’s faces looked very similar and his Red Hulk seemed awkward. Noto on the other hand does a great job here. Everything feels cinematic and the action is handled well. The splash page near the end with the team taking down the terrorists is violent, bloody and insanely well drawn. He does a great job with expressing character’s emotions in their facial features as well, such as Punisher suspiciously looking over his shoulder at Deadpool and Elektra’s after shooting him. The only problem I have is with Red Hulk’s hair. It’s a military style flat top and while appropriate for a character with military background, looks awkward. As far as I know, he’s never been drawn this way and it distracted me a bit from the story. Plus I think J. Jonah Jameson has that look trademarked. Still, it’s great stuff and I hope he stays on the title for a while. I’m enjoying Thunderbolts quite a bit. I know it’s no longer anything like it originally was but it’s working. This issue while fun, slipped in quality, presented interesting ideas that were oddly implemented and made the story predictable. The whole subplot involving Deadpool, Punisher and Elektra continues to drag as well, taking up too much space. Phil Noto’s pencils are great and give the book a very cinematic feel. I like Way’s writing, but I fear I can see where this is going. Thunderbolts #8 gets 2.5 out of 5 stars. There is no “love triangle” going on here… do you even know what that even means??? Because a love triangle involves a person that is torn between two people… but Elektra has already chosen and she made it clear herself (who to sleep with that is). In this case, it’s all from Deadpool and that’s called an “obsession”… not a love triangle. My use of the term love triangle was not meant to be literal. That’s why I put it in quotes, because you’re right, it’s not a love triangle. It’s more a twisted version of a love triangle and, at least in Deadpool’s mind, there is interest there. I think my meaning, and use, may have been lost on you and I also could have made it clearer. Thanks for reading! Daniel Way is writing a much better script in this story arc then the last one. Phil Noto’s art looks amazing with GURU eFX’s colors. I disagree on the military haircut that Ross has; it makes him look different from Bruce Banner’s Hulk.